size, which translates into reduced fecundity. Mayflies reared in laboratory microcosms with trout odor matured at smaller size relative to individuals reared without exposure to trout odor (Peckarsky and McIntosh 1998). This effect was supported by comparisons of streams that contained or lacked brook trout, and induced when water from containers with brook trout was added into previously fishless streams (Peck-arsky et al. 2002). Many aquatic invertebrates use the current as a means of dispersal, and the number of individuals in the water column can be surprisingly large. The strong nocturnal periodicity of drift fascinated and perplexed early workers, who documented that numbers captured in suspended nets during the day were very low, but increased by one to several orders of magnitude at nightfall and remained high but variable until dawn (Muller 1963, Brittain and Eikeland 1988). 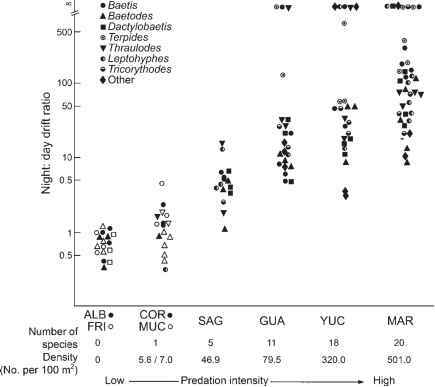 The finding that nocturnal periodicity varied among size classes and taxa in accordance with predation risk, so that less vulnerable taxa were nearly aperiodic and more vulnerable taxa were strongly nocturnal, made it apparent that nocturnal drift was an adaptation to reduce predation (Allan 1978). In rivers of the Venezuelan Andes, the night to day drift ratio for a number of mayfly taxa increased dramatically along a gradient of increasing predation intensity, providing further support for the view that predation risk governs drift periodicity (Figure 910). Whether benthic invertebrates enter the drift actively, in search of food-rich locations and perhaps to escape predators, or are passively swept from the substrate, is not fully resolved. Because high food levels reduced drift in laboratory studies, and the absence of food resulted in at least modest levels of day drift, Kohler (1985) concluded that the relationship between food availability and food demands influenced drift entry, subject to constraints mainly due to predation risk. which is consistent with laboratory studies that usually find an innate nocturnal pattern to drift. However, in headwater streams and other circumstances where fish presence or absence is less predictable, an induced response to chemical cues signaling fish presence would be adaptive. 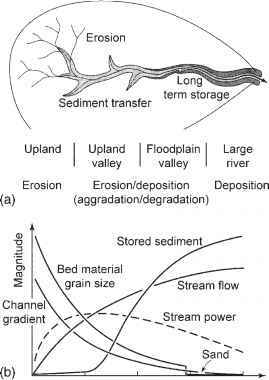 This is supported by a study of Rocky Mountain streams where rapid, size-specific changes in drift periodicity occurred in response to the addition of water that contained brook trout in a region where drift was aperiodic in fishless streams but nocturnal in streams containing brook trout (Mcintosh et al. 2002). Addition of predator odor to stream-side channels (Mcintosh et al. 1999) and to a reach of a fishless stream (Mcintosh and Peckarsky 2004) caused mayflies to become nocturnal. (typically just the predator density is manipulated) and do not seriously restrict the flow of water are desirable because they are more natural. Cages tend to be small, on the order of 0.1 to perhaps hundreds of square meters, although some ambitious efforts have manipulated fish densities at larger scales. When prey are free to depart, patch-scale studies often detect behavioral responses rather than predator consumption, whereas closed systems may allow the predator excessive opportunity to deplete prey. Because movements and behaviors decrease in their influence as spatial scale increases, the consequence of a reduced perimeter to area ratio, large-scale experiments can more accurately detect direct consumption effects on mortality rates and population processes. Using models to investigate how treatment impacts should vary with spatial scale in predation experiments, Englund (1997) concluded that the area-specific migration rate must be <1-5% per day for an enclosed population to behave in a representative fashion; for most systems that requires an area that is imprac-tically large. Meissner and Muotka (2006) addressed the issue of scale through a study of brown trout predation using small-scale field experiments, a larger-scale survey of fish and fishless streams in northern Finland, and a meta-analysis of over 20 published studies. Sal-monids had their greatest impact on larger prey and this was consistent across the three analyses, which the authors interpreted as evidence that effects were through direct consumption rather than behavioral responses. It is difficult to perform large-scale manipulations of the density of invertebrate predators, and so all experimental studies have been small-scale enclosure or exclosure experiments. From a meta-analysis of studies of predation on stream macroinvertebrates, Wooster (1994) concluded that the impact of invertebrate predators was greater than vertebrate predators. However, fish enclosures were larger and used larger mesh than did invertebrate enclosures, and there was a significant inverse relationship between effect size and enclosure size. Thus one cannot rule out the possibility that the experimental scale of invertebrate predation studies contributes to the finding of relatively strong effects on prey abundance. Indeed, because total prey consumption generally is greater for fish than for invertebrate predators, it seems more plausible that the latter have a smaller effect on prey abundances, and results obtained using small cages are best suited to identifying mechanisms of preference and avoidance rather than population effects.